Live TV where you are. Some TV events just can’t be missed: the sports match of your favourite team, the final episode of the series you’ve watched all season or the movie everybody will be talking about the next day. With EyeTV W, catch live TV in the park on a sunny day, at the airport while waiting for your plane to arrive, or simply as a second TV at home when other family members seize control of the remote. Watch TV on any tablet or smartphone. 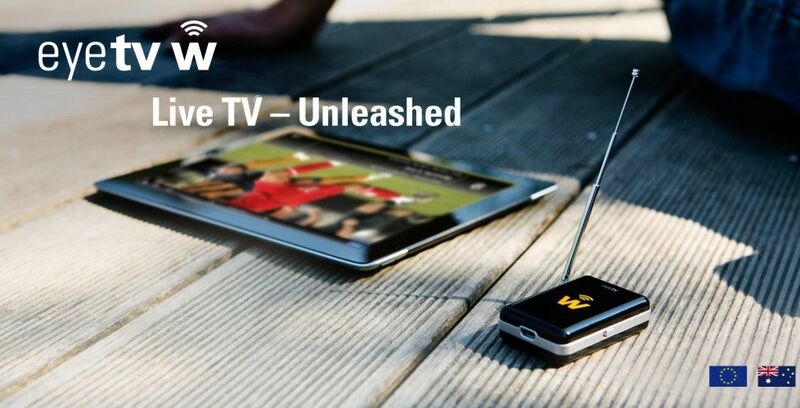 EyeTV W is the only TV accessory you will ever need, no matter which smartphone or tablet you fancy. Free apps turn your iPhone, iPad, iPod touch, Kindle Fire, Android smartphone or tablet into a portable TV, making EyeTV W the most versatile choice. EyeTV W is the most advanced mobile TV hotspot and yet, you’ll be surprised how all of this fits into a package this small. Weighting only about a third of your smartphone, there really is no reason not to take EyeTV W along with you to watch live TV, completely unleashed. EyeTV W requires an Android device with a 1 GHz or faster dual-core ARM CPU and Android 4.0.3 (“Ice Cream Sandwich”) or later. Playback of MPEG-4/H.264 video requires a processor with NEON support (e.g. Tegra3). EyeTV W supports MPEG-2 video in standard and high definition, MPEG-4/H.264 video in standard definition as well as DVB-T radio, if available. High definition MPEG-4/H.264 channels, encrypted programs and/or DVB-T2 broadcasts are not supported.